My August 12 PET-CT scan still shows No Evidence of Disease (NED). Woohoo! Having completed 10 cycles on Xalkori without progression, I now go to Denver at 8-week instead of 4-week intervals for my ROS1 clinical trial, and have labs drawn at my home clinic between Denver visits. I have muddled my way through hamstring rehab and am back to VERY basic strength training with light aerobic exercise on the recumbent bike and treadmill. The best description I can find for my state of fitness is “wimpy.” If I walk one city block here at sea level at a moderate pace (about 2.5 mph), my breathing speeds up a good bit and my heart rate rises to 140! I have to use an oxygen compressor to walk in Denver without gasping or stopping after 500 feet. The persistent Xalkori-induced edema isn’t helping. The physical therapist tells me it will take a looooong time to rebuild the muscles that have atrophied due to disuse and cancer treatment. I made sure she gave me clear guidelines about pacing my recovery, because, as you all know, I’m SO good at taking things slow. I’ve developed something called “trigger finger” in my hands, and the oncologist says he doesn’t think it’s related to taking Xalkori (although edema might play a role). Because of this and some other issues, I’ve scheduled an appointment with my primary care doctor to discuss whether my thyroid is starting to misbehave in response to the radiation dose it received last year. However, other non-cancer conditions could cause my symptoms, too. Rather than diagnose myself (I know, I know — why stop now?) I’ll hear what my PC doc thinks. So, here I am, just taking life slow, glad I’m around to enjoy the magnificent Pacific Northwest summer. I’ll be speaking at the World Science Fiction Convention in San Antonio this year over Labor Day, then mostly hanging around the house attempting to declutter and find the floor of my den once again. 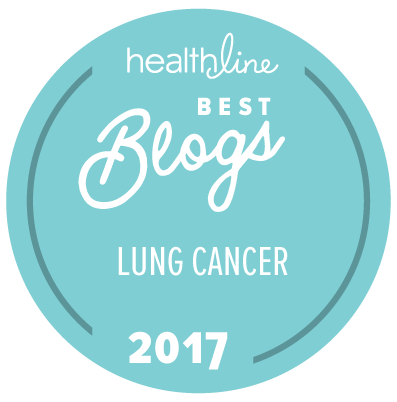 This entry was posted in Lung Cancer, The Bright Side and tagged clinical trial, Hope, Lung cancer, NED, PET-CT scan, ROS1. Bookmark the permalink. Good to hear “No Evidence of Disease.” Excellent! Your spirit is so sweet. Blessings for the best in your next step on this journey. Aw, Janet, you are so amazing the way you take life in stride and keep coming back for more. Bless yer li’l pea-pickin’ heart! That’s awesome Janet. I related completely to the wimpy state of your physical condition. Because of a long bout of bronchitis and then spinal compression fracture, I am in the same state. We just rebuild ourselves gradually, I guess. Good luck with your recovery too, Diane.